Dewey's City Manager Kevin Trease gave a sales tax report to start the Dewey City Council meeting Monday night. Trease said sales tax collections were way better this time around as the total sales tax rounded out to $60,773. Tobacco tax collections came in at $589 and use tax came in at $6,729. Trease said that was about a 6-percent change from the same time last year. He also said it was the best report Dewey has seen this time in the year for the last three years. Dewey Police Chief Mike Shae gave a report next. 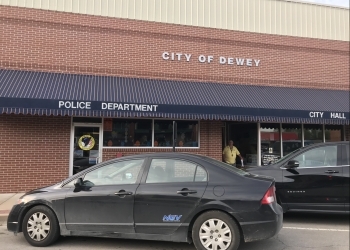 Shae told the Dewey City Council that the Dewey Police Department has twelve officers working at the station again. Two new officers have been hired. Dewey Police Captain Bob Burke recently retired and was working part time with the Dewey Police Department. Police Chief Shae said Monday that Burke has since accepted a position with the Washington County Sheriff's Office as a Transport Officer.